Exhibitions are coming thick and fast and my framer said he would take some paintings to put in his window. Canals are quite a popular theme with the Leeds Liverpool canal running along close-by. I was a bit short of suitable paintings and had this image. I like the narrowboats against the backdrop of the old mill. 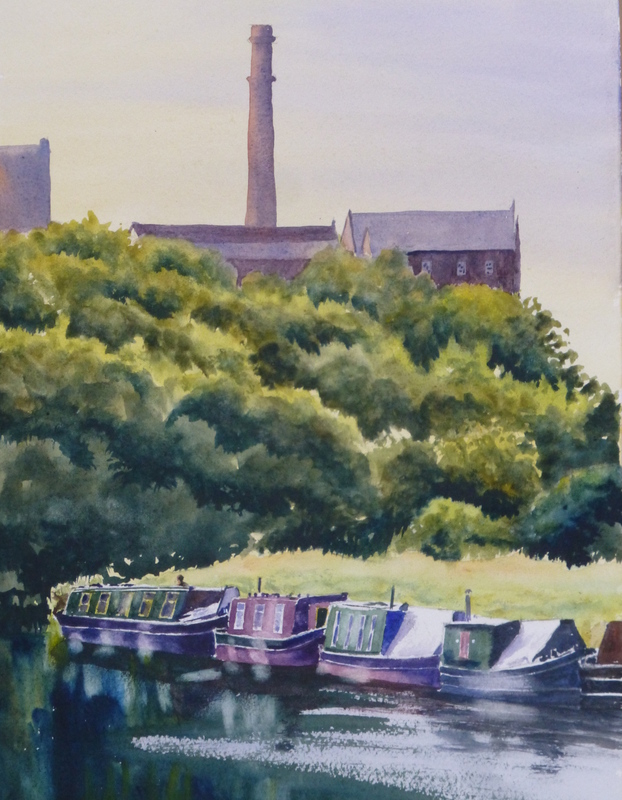 I did a similar theme a long while ago where I got up close to the narrowboats, again with the mill in the background and the trees giving deep shade to counterpoint the lit surfaces. It was a favourite painting and sold quickly. This view pulls back a bit, but I thought that it would still make a great subject. Anyway it is in a frame now along with eight others. Now I need to focus on the next exhibition. Thankfully they only want two. This entry was posted in Burscough, canals and narrowboats, watercolour and tagged Burscough, canal, Lathom, Leeds Liverpool Canal, Narrowboats, painting, paintings, watercolor, watercolour, watercolours. Bookmark the permalink. You need to check out Graham McQuade. He is a great painter and I’m glad I stumbled across his blog! Thanks Eli, I appreciate the reblog.